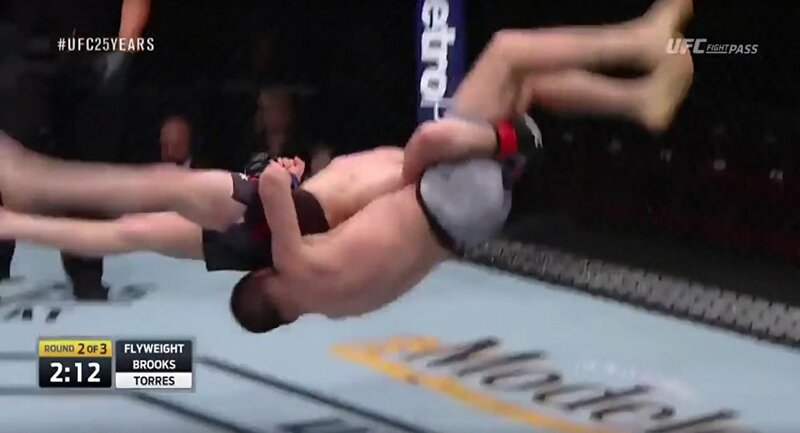 American flyweight Jarred Brooks seemed to have been winning his UFC Utica matchup against opponent Jose Torres when his attempted slam unexpectedly went awry. As Brooks picked up Torres for a throw in the second round of the opening Fight Pass of UFC Utica bout in New York, he apparently got a bit of extra leverage, which, under the most bizarre of circumstances, ended up in a botched slam knocking Brooks himself out. While Brooks landed on his head, Torres, a former Titan FC champion, didn’t hesitate to pounce with a ground-and-pound to finish him, scoring a second-round TKO win in his promotional UFC debut. — UFC (@ufc) 1 июня 2018 г. — UFC (@ufc) 3 июня 2018 г. — Augusto Cesar (@x23Kaoru) 1 июня 2018 г. — Rodrigo Machado (@rmachado_bc) 1 июня 2018 г. — Kevin Thang (@Skip2MyJays) 1 июня 2018 г. — jelapeno muncher (@Joebing9) 2 июня 2018 г. — Chas Skelly (@ChasSkelly) 1 июня 2018 г. After being finished for the first time ever, Brooks fell to 13-2, while Torres improved his record to 8-0.